Meanwhile mate's DSL-2880L WILL NOT work off WAN port for him... Everything is the same but steadfast NO-GO! We meet up and exchage modems. Still his arrangement will not work on his almost 1yrold Fibre Install. His unit fine on my install! It appears Telecom used some other kind of cable standard in their earlier installs... So always try doing a CHANGEOUT of your original ONT run folks if you are dealing with an earlier Fibre Install and save a whole lo of hassle...! Crossover vs non crossover perhaps? Sounds pretty odd to me. All the original Spark supplied modems such as the Techicolor ones and the Huawei ones always came with a straight-through RJ45 cable. No cross over or anything special. Sounds like you may have had a dodgy cable or something. 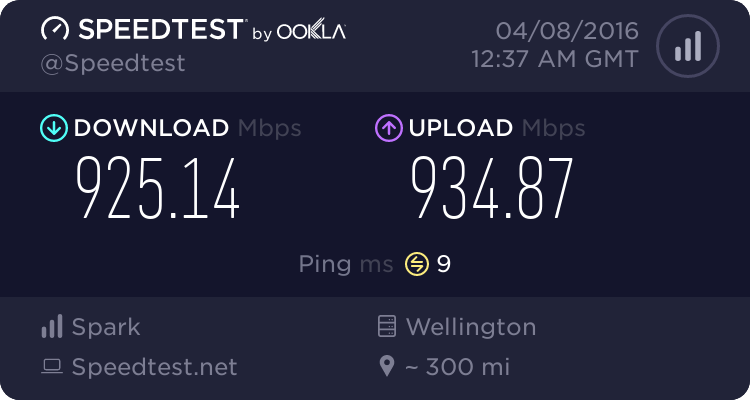 My pick would be a dodgy Ethernet cable that refuses to negotiate at 1Gbps. Such cables aren't uncommon - but can clearly only support FE, not 1Gb Ethernet. What Steve said, seen cables like that before.. Will work fine for 10mb/100mb ethernet, as they only use 4 wires (hence the ability to use splitters to run 2 data/voice lines down one single line). Gigabit Ethernet uses all 8 wires, so won't work on such a cable. Lias: What Steve said, seen cables like that before.. Will work fine for 10mb/100mb ethernet, as they only use 4 wires (hence the ability to use splitters to run 2 data/voice lines down one single line). Gigabit Ethernet uses all 8 wires, so won't work on such a cable. a really el chepo solution of witch I the best place is in the rubbish!